PHUKET: Confusion over the rules governing Phuket beaches continues, with the governor today slamming local police tactics to “enforce” sun lounger restrictions outside designated zones. Governor Nisit Jansomwong was responding to a series of viral posts by one Facebook user called “Decha Sithidej”. The posts, including several appeals in Thai to “help Phuket tourism”, are accompanied with mobile-phone quality photographs and video clips showing uniformed Thai police confronting tourists – some of them elderly – on the beach this past weekend. Defiant tourist sentiment was heightened this morning when a group of some 100 had reportedly stormed to Kamala police station to "demand clarification on the rules"
It is clear from the video clips that no tourist was arrested or forcefully removed from the beach. If anything, a communication barrier is apparent between police and the tourists. The governor went on to slam misleading communication tactics employed by police at Surin, Kamala and Patong this past weekend, referring to the dissemination of confusing and mistranslated flyers. 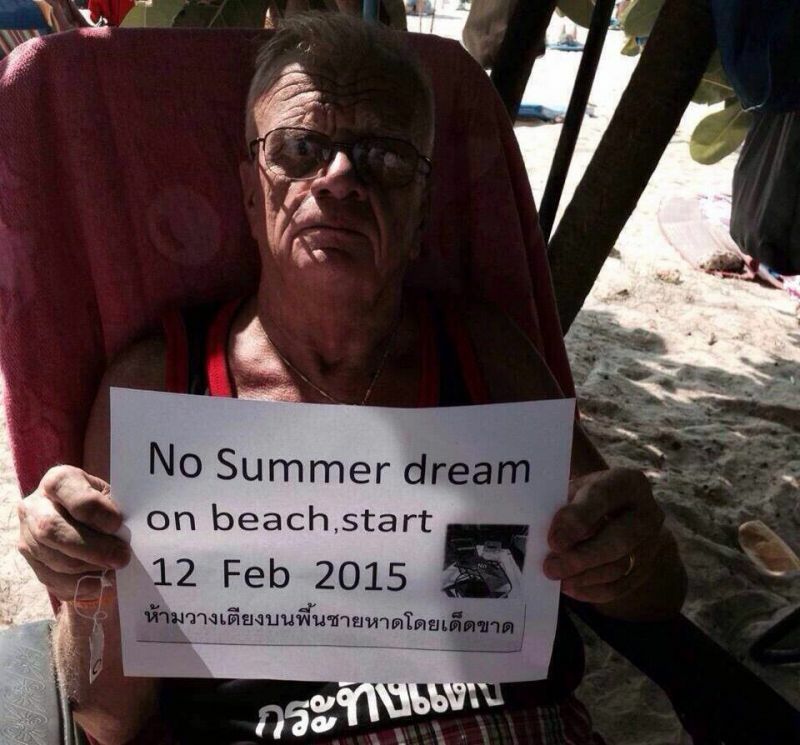 However, the English message prompted a lot of itchy scalps, as it read, “No Summer dream on beach, start February 12”. The governor said he had not made any orders for such flyers to be printed or disseminated and he warned officers not to continue to disseminate any more such messages. The governor went on to reiterate the rules. "Tourists can bring mats, cloths or cushions [and place them] outside the 10 per cent zoning area where umbrellas are allowed. “I have stressed with the officers already that we need public relations not law enforcement at this starting point, as [maintaining a good] tourism image is essential to our province." See also, Tim Shaw speaks with Phuket's German Honorary Consul about the confusion on today's Lunch on Live here. Illegal vendors cannot be controlled by the authorities, so the easy target compliant tourists are being controlled instead. Happy holiday. Great my customer told me that as the raid started all local vendors took their chairs and run the other direction as the police. the only people left where the tourist with their own chairs. But right after that as the beach was cleared the para sails started to land on the beach again- this did not disturb any police man - what a joke! I encourage every reader to view the posts of Decha Sithidej. They are depressing and indicate just how ridiculous and laughable Thailand has become. I would suggest to tourists that they head for Cha Am and Hua Hin. No problems there with sunbeds and umbrellas but is that because they are predominently Thai holiday destinations? @derngt Some of us expats like to take our chairs to the beach too! Why should Visitors to Thailand not be allowed to take their own Sun Loungers anywhere they want onto a beach? What is the logic? I have been spending five to six months a year in Phuket for the past 5 years and I speak pretty good Thai. Today I asked an officer who was telling an old lady she could not use a chair what he wanted us to do. He screamed \"Go back! Go out! You no good!\"I am doing as he says, because this situation may get dangerous for turists and expats. Phuket Poll: Should tour guides or tourists be charged for coral damage?